New Jersey governor Chris Christie has managed to anger practically everyone by calling for a special election to replace New Jersey's U.S. senator Frank Lautenberg who passed away this week. Everyone that is, except his own election team. The right was already mad at Christie for having embraced president Obama in the wake of hurricane Sandy just prior to the 2012 election. Many see it as having stalled Mitt Romney's momentum as he had gained on, and even surpassed Obama in polling. Of course not everyone on the right was sad to see Romney lose as he had a lot of RINO red flags of his own. But this was an us versus them election and Christie was sleeping with the enemy. It wasn't the first red flag for Christie, nor it turns out would it be his last. Having declined to appoint a Republican to replace Lautenberg until 2014, he gave up a chance to give some Republican a fighting chance in that 2014 election in a very Democratic state. But Democrats aren't happy with Chrisite's decision either. The special election is only a few weeks before the next statewide election in which Christie is up for re-election as well. By having it on a non-election day Christie may avoid helping Democrats with greater turnout on the regularly scheduled November election day. And who knows, on a non-standard day, perhaps a Republican could actually pull off an upset and win the senate seat. Democrats are laughably saying it will cost a lot extra for the state to do this. Expense control and Democrats don't belong in the same paragraph, but it's the argument they are trying to use. In the end though, Democrats will in all likelihood win this special election. 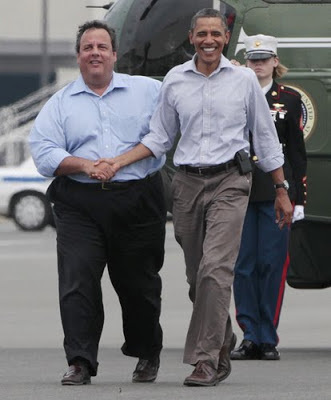 What they are really trying to achieve here is to unseat Christie. They want every edge they can get and Christie has appeared bi-partisan enough (embracing Obama after hurricane Sandy) that Democrats would need every edge they can find to unseat him. Christie has proven himself to be a RINO. He first came across as a Tea Party pragmatist but has since turned out to be a political opportunist. He's doing what he needs to do to further his own political career which very likely includes ambition for a stint in the White House. Christie's actions continue to be Christie-centric. How does this special election help Christie? By dampening possible turnout this November, Christie improves his chances of winning re-election as governor of the state. That in turn makes the notion of his ability to win, even in a blue state, stronger. It improves his chances to win the GOP nomination in 2016 and perhaps the presidency as well. Some low information Republican voters might see Christie's special election move as a populist maneuver. He's saying the people should decide and not him. Never mind that he was elected to do a job, including making appointments, many voters won't see that. And many will see him as being post-partisan. On the right, Christie also can make the argument that he's not impacting the balance of power in the senate so it's folly to make a purely partisan pick. He can contrast himself with a Democratic governor who was truly wrong in his approach to appointing a senator - Rod Blagojevich. In reality, no matter who Christie would have picked it would have created detractors. He sidesteps all of that. But in doing so he has also sidestepped his conservative obligations. While an appointee would not shift the senate balance of power, he has still outed his self-serving nature in this decision. It's a genius move although I don't think most conservative voters will fall for it. But Christie is looking to establish a base that includes more non-aligned voters and some Democratic voters who see him as being less partisan than other Republicans. On balance it probably wins him more votes in New Jersey than he loses though. But that's why I call him a RINO. RINOs by definition are typically those GOP senators or representatives but all to often vote with the Democrats. A broader definition is needed - those GOP party members who put personal gain ahead of party principles (whether it's voting with Democrats or self-serving decisions in general). A lot of GOP leadership could be described as RINO by that definition. I'm okay with that because it applies to a lot of people in the GOP. Christie may have helped his re-election chances and his chances in 2016, but it's really not helping him with conservatives nor should it.